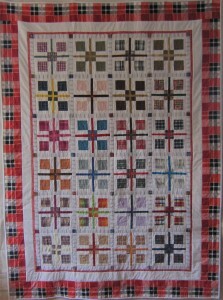 I’ve finished the first of 2 quilts from last April’s winnings – Hot Cross 9 Patch. More on my blog, if you’re interested. I think your sashing and border choices are just perfect! I liked reading your fabric selection process on your blog. I love the sashing and borders. They go together well. I’m glad the blocks have found a good home.